Synopsis : Rebecca, a 15-year-old American, isn't entirely happy with her life, comfortable though it is. Still, even she knows that she shouldn't talk to strangers. So when her mysterious neighbour Miss Hatfield asked her in for a chat and a drink, Rebecca wasn't entirely sure why she said yes. It was a decision that was to change everything. 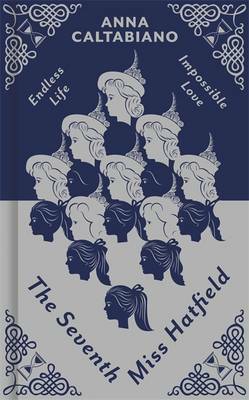 For Miss Hatfield is immortal. And now, thanks to a drop of water from the Fountain of Youth, Rebecca is as well. But this gift might be more of a curse, and it comes with a price. Rebecca is beginning to lose her personality, to take on the aspects of her neighbour. She is becoming the next Miss Hatfield. But before the process goes too far, Rebecca must travel back in time to turn-of-the-century New York and steal a painting, a picture which might provide a clue to the whereabouts of the source of immortality. A clue which must remain hidden from the world. In order to retrieve the painting, Rebecca must infiltrate a wealthy household, learn more about the head of the family, and find an opportunity to escape. Before her journey is through, she will also have - rather reluctantly - fallen in love. But how can she stay with the boy she cares for, when she must return to her own time before her time-travelling has a fatal effect on her body? And would she rather stay and die in love, or leave and live alone? And who is the mysterious stranger who shadows her from place to place? A hunter for the secret of immortality - or someone who has already found it?